Of all the stones in the British royal collection which are notable enough to earn their own name – and there are many - this is perhaps the most infamous. And infamy in this collection so diligently watched over by the queen is enough to land a spot on my little countdown. The Koh-i-Noor diamond probably came from India, which is one of the earliest known diamond-producing countries. If certain ancient texts are to be believed, it could be more than 5,000 years old, but more concrete mentions of the stone reference its existence just after 1300. "He who owns this diamond will own the world, but will also know all its misfortunes. Only God, or a woman, can wear it with impunity." The interesting thing about the curse is that history has held it up so far. For centuries, the Koh-i-Noor was passed around as a spoil of war, won and lost in bloody battles between countries and dynasties and even within families. The owners knew great power and great defeat with an often violent end. From India, the diamond went to Persia with Nadir Shah (who, by the way, was ultimately assassinated – another violent end). From Persia, the diamond ended up in Afghanistan, and from Afghanistan it returned to India. But when the kingdom weakened and the British successfully invaded, it was time for the Koh-i-Noor to change hands again. At the insistence of Lord Dalhousie, the transfer of the Koh-i-Noor’s ownership to the British rulers was included in the Treaty of Lahore. Dalhousie’s initiative wasn’t met with universal approval – there were those that felt it should have been a gift, and there were those that felt that a cursed stone shouldn’t have been given to their queen at all. But to Dalhousie, it was part of the spoils of war – just as it had been for centuries. The new Maharaja, Duleep Singh, presented it to Queen Victoria in 1850. The stone became a centerpiece of the Great Exhibition in London in 1851. 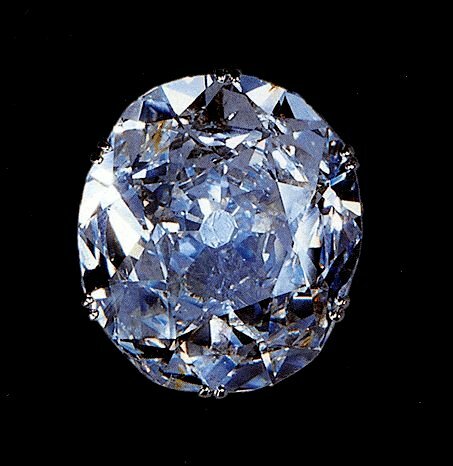 The Koh-i-Noor was hailed as one of the world’s largest diamonds, but by the time it reached Britain it was a shadow of what it had once been. 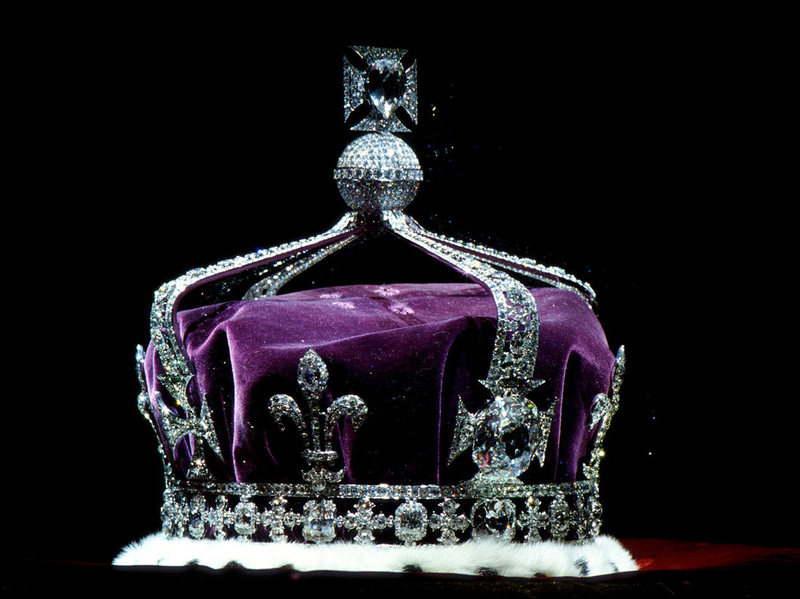 Its initial weight was said to have been 793 carats; thanks to a terrible hack job by a jeweler while the stone was with the Moghuls it was cut down to 186 carats. Even with all that cutting, it was still something of a disappointing gem. Prince Albert decided to cut it down further, turning it into a more conventional shape and increasing its brilliance. After much consideration and time and money, in 1852 the stone lost nearly another half of its weight. Today, it clocks in at 105.6 carats. (And reportedly, Albert still wasn’t pleased.) 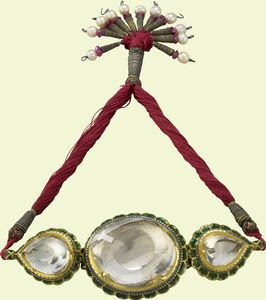 Queen Victoria mounted her new stone in a brooch setting, and also in the front cross of her Regal Circlet or as the center of the Timur Ruby necklace. After Victoria's passing, the stone was used by Queen Alexandra. She placed it front and center in the new crown made for her 1902 coronation alongside her husband, Edward VII, something that would continue through the next generations. 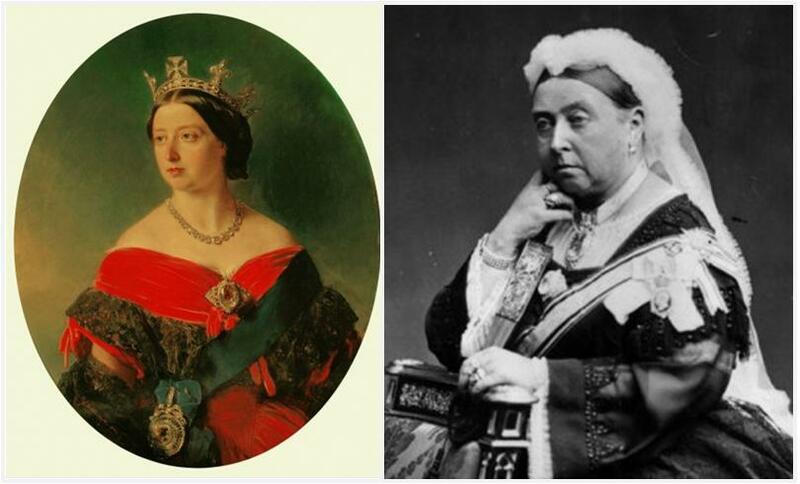 The Koh-i-Noor's inclusion in queen consort crowns only after Victoria's use means it has only been worn by females since arriving in Britain - a recognition of the curse or pure coincidence, I'll let you decide. 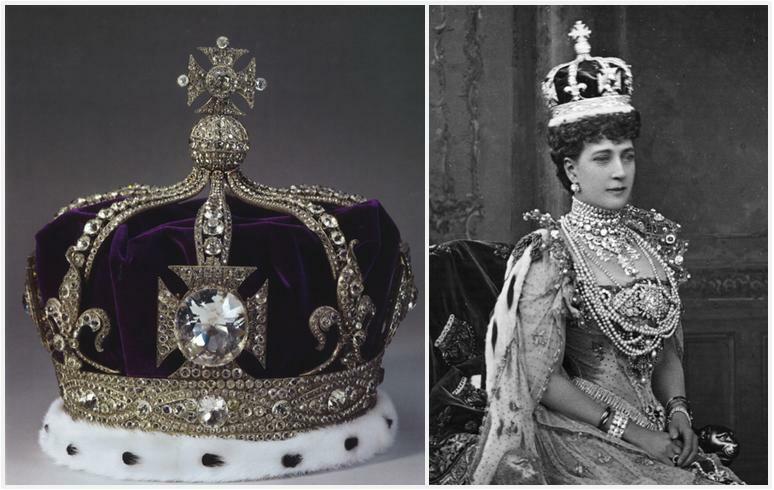 After Edward VII's death, the stone was given to Queen Mary for inclusion in her brand new consort crown for the 1911 coronation. Mary, no doubt appreciating both the history and the carat weight, also continued the tradition of wearing the stone as a brooch when not in her crown. Queen Mary had intended for her own crown to be used by all future queen consorts, but when she decided to break tradition and attend her son's coronation, the new Queen Elizabeth had to have a new one made up. Mary handed over the Koh-i-Noor, and it became the centerpiece of the new crown. Elizabeth also wore it for her daughter's coronation in 1953, as a part of the circlet created by removing the arches to the crown. According to Hugh Roberts in The Queen's Diamonds, Elizabeth had a new brooch setting made for the diamond in 1938, but doesn't seem to have used it. 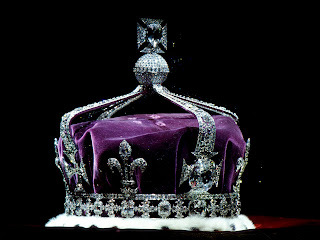 The Koh-i-Noor rests in the Queen Mother's crown currently, and is on display at the Tower of London. The Koh-i-Noor's bloody history still causes controversy today, as the debate over ownership continues to flare up. 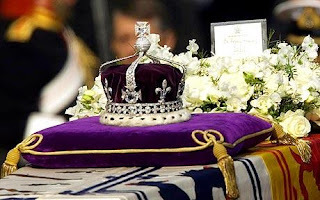 Many feel that Britain should return the diamond to India. But given that the stone was stolen at every turn throughout its existence, where exactly would you stop once you've started turning back time? India's claim is certainly the most publicized one, but there have also been groups out of Pakistan, Afghanistan, and Iran that want the gem. And if Britain did give it back, what kind of precedent would that set? That's exactly the argument Prime Minister David Cameron used when confronted about the diamond on Indian television in 2010: soon enough, the British Museum would be emptied (such a precedent could empty many museums throughout the world, really). Cameron said it was going to stay put, and so it has. A diamond this large and this well-known deserves a spot on any countdown, and I personally can't imagine a list of top diamonds out of Britain without it. The reason this comes in at a measly number six is quite simple: the current queen has never worn it. She could, she could certainly have it taken out of her mother's crown and use the brooch setting for it or something, but she hasn't. And I suspect, given the political correctness climate, she never will.